Is there anything quite as beautiful as walking into a home with new wood floors? 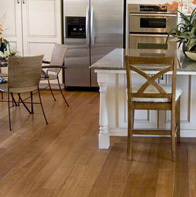 There is something that appeals in an organic way when we add wood flooring to our home. It is an opportunity to bring some of the “outdoors-in” by integrating natural elements into our interior space and since no two natural wood grains are the same your floor will have a unique look. Beyond the design appeal of a wood floor, there are many practical reasons to choose one for your home or commercial space. First, wood floors are very easy to maintain and clean. After the floor is sealed, dirt and debris does not stick to it making it very easy to keep that fresh new look in your home longer. Wood floors also resist denting or scratching, making them an ideal choice for high traffic areas of the home, such as kitchens and entrance, or recreational rooms. Wood floors are the perfect choice for people who suffer from allergies. The non-porous surface means that your wood floor will not hold or accumulate things like dust, airborne pollen or animal dander. When properly cleaned and maintained, wood floors will accentuate the beauty of your home for years and increase your home resale value. Looking for more advice on hardwood flooring? Contact our customer service department at 855-433-2587 for free advice on wood floors and other options for your home.